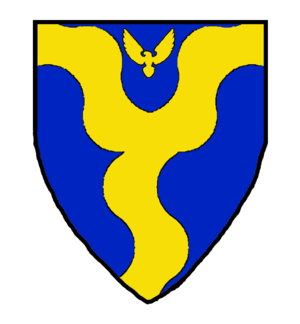 The Carolingian Calivers Company is the baronial fencing melee unit of Carolingia, specializing in caliver and harquebus tactics and RBGs, and small-unit fencing melee strategies. The Carolingian Calivers were chartered into the barony at the Carnival of Venice event on 18 Feburary Anno Societatis XLVI. 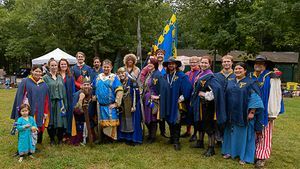 The Carolingian Calivers can be recognized by their blue and gold cassocks, fencing prowess, and fun demeanor. The unit's flag is based off a common banner design during the Thirty Year's War. They really loved their checkered pattern back then. Whereas divers gentlemen & others, out of the care of the publike weal & safety by the advancement of the military arts, & exercise of armes, have desired of the Baron to joyne themselves in one company, & to have liberty to exercise themselves at such times as their occasions will best permit, & that such other liberties & privledges might bee granted them as the Baron shal thinke meete for their better incuragement & futherance in so usefull implement, which request wee have thought fitt, upon serious consideration & conference with the diverse of the principall of them, to set down order herein, as followeth. Imprimis, wee do order, that Lord Duncan Pierce Stanton, Remy Delamontagne de Gascogne & such other as are already joyned with them, & such as they shall from time to time take into their company shall bee called the Carolingian Calivers. 2. They, or the greater number of them, shall have liberty to choose their captaine, leiftenant, & all other officers, their captaine & leiftenant to bee alwayes such as the Baron shall allow of, & no officer to bee put upon them but of their owne choyce. 3. They have liberty & power to make orders among themselves for the better maunaging of their military affaires, & they may appoint an officer to levy any fines or forfeitures wch they shall impose upon any of their owne company, for the breach of any such order. 4. The said military company are to have fifty dollars per yeare from the Exchequer of the Barony for the use of the present company, & any such as shall succeede in the same, for providing necessaries for their military exercises. 5. The said company shall have liberty, at the times appointed, to assemble themselves for their military exercises in any towne within this barony, at their owne pleasures. 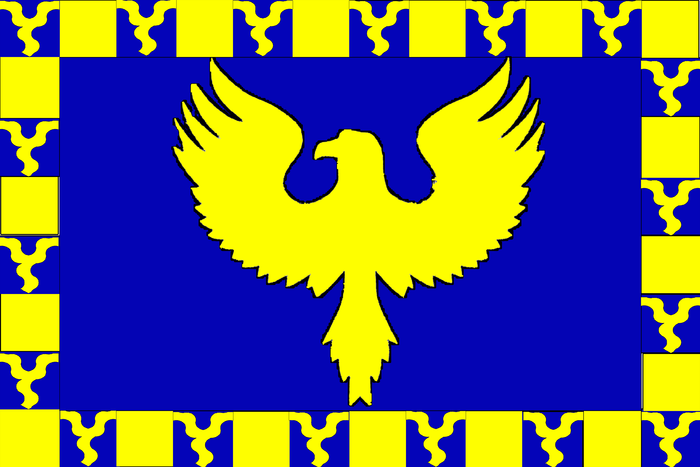 Provided, alwayes, that this order or grant or anyhthing therein contained, shall not extend to free the said company, or any of them, their persons or estates, from the government of the Barony and of the Kingdom of the East here established, and they shall serve at the command of said in their warres and necessities as required by the Baron and the King and their rightful Marshalls and Commanders. 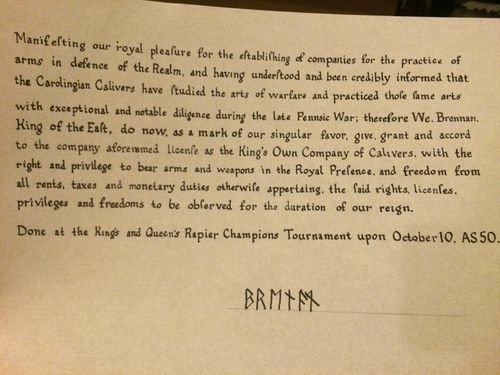 At EK Rapier Champions, Brennan Rex II honored the Carolingian Caliver Company, naming them His Own Company of Calivers for the duration of his reign. "Manifesting our royal pleasure for the establishing of companies for the practice of arms in defense of the Realm, and having understood and been credibly informed that the Carolingian Calivers have studied the arts of warefare and practice those same arts with exceptional and notable diligence during the late Pennsic Wars; therefore We, Brennan, King of the East, do now, as mark of our singular favor, give, grant and accord to the company aforementioned license as the King’s Own Company of Calivers, with the rights and privilege to bear arms and weapons in the Royal Presence, and freedom from all rents, taxes and monetary duties otherwise appertaining the laid rights, licenses, privileges and freedoms to be observed for the duration of our reign." This page was last edited on 29 March 2019, at 16:34.